Autumn sneezeweed is a showy, yellow-flowered perennial species in the Aster family. In BC, we recognize two varieties: var. grandiflorum and var. montanum. Var. montanum is the more common variety (found strictly west of the coast mountains), while grandiflorum is blue-listed in the province. However, Flora North America does not recognize the varieties and recognizes only one taxon in North America. Lomer (2011) provides the following description of var. grandiflorum in his article on the rare plants of the Fraser Valley: "This is one of the relatively few native BC plants that has found a place in the horticultural trade. Var. grandiflorum is a larger variety with longer ray flowers and more numerous heads, in well-grown plants at least. It is difficult to tell from the common var. montanum which is a variety that grows on river shores along the Thompson and Fraser Rivers as well as several other places in southeast BC. Var. 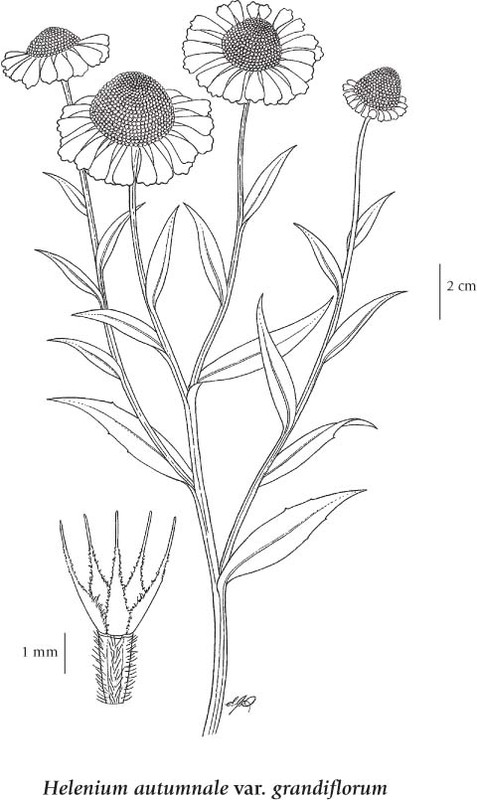 montanum also can be found as a native plant in riverbars of the upper Fraser Valley from Agassiz to Hope and rarely downriver as well, usually in sand dredgings. Var. grandiflorum can be told by its larger flower heads and rays, taller stature and more robust habit. Perennial herb from a fibrous root; stems erect, solitary or few, sometimes branched at the base, branched above, minutely hairy with upwardly-curved hairs or nearly glabrous, 0.15-1.2 m tall. Basal leaves soon deciduous; stem leaves alternate, numerous, glandular-dotted, usually wing-margined at the base, lanceolate, narrowing to an unstalked or almost unstalked base, shallowly toothed or nearly entire, 3-15 cm long, 5-40 mm wide. Heads with ray and disk flowers, several to numerous, terminal; involucres 6-8 mm tall; involucral bracts narrow, soon deflexed; ray flowers 10-20, yellow, 3-lobed, 1-2.5 cm long, soon deflexed; disk flowers yellow. Achenes angled, appressed stiff-hairy on the angles; pappus of egg-shaped or lanceolate, long-pointed scales, broadened at the base, about 1/2 the length of the disk flowers. 1. Ray flowers 1-1.5 cm long; plants 15-80 cm tall.................... var. montanum (Nutt.) Fern. 1. Ray flowers 1.5-2.5 cm long; plants 40-120 cm tall..................... var. grandiflorum (Nutt.) T.& G.
Moist to mesic streambanks, meadows and forest openings in the lowland, steppe and montane zones; rare (var. grandiflorum) to frequent (var. montanum) in S BC; N to NT, E to PQ, and S to FL, TX, and AZ.